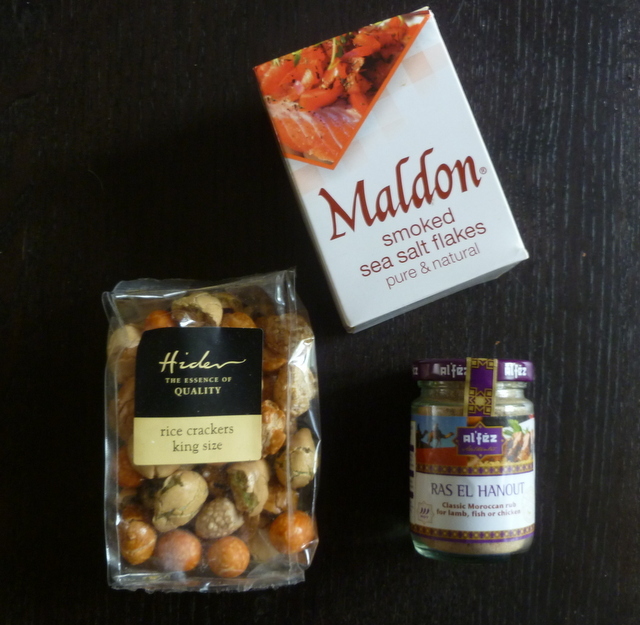 It’s Foodie Penpals time again. This will be my last box for a little while, but I look forward to joining in again in the New Year. I will continue to look around for other people’s updates, and blog posts. 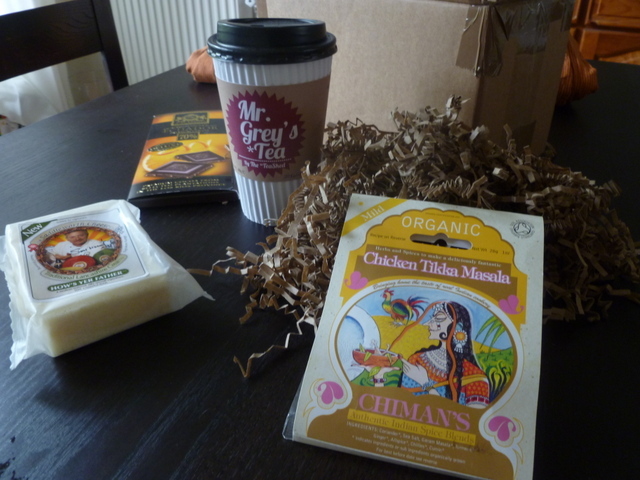 I really enjoy the scheme, and getting a box of food is like a little Christmas each month. And I have “met” some lovely people too. As always, thanks to Carol Ann of Rock Salt, who organises this so well each month Europe. This month, I was paired with two readers again. I sent a parcel to Kelly, but unfortunately her parcel seems to be languishing in the sorting office. 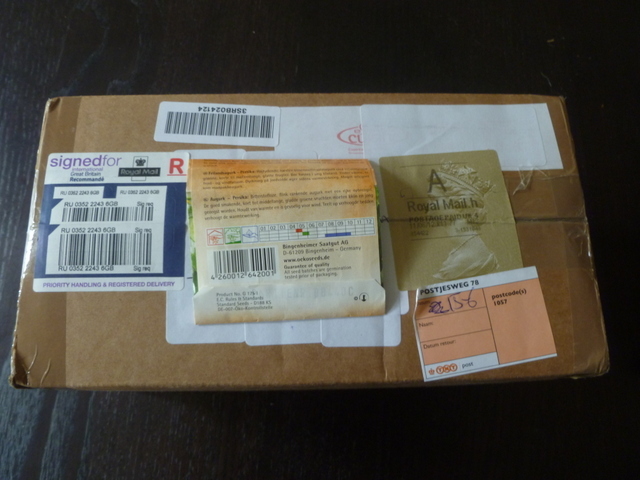 We are trying to sort this out now, and I hope that she will soon be able to do a guest post about her parcel. As usual, I sent her a few typically Dutch items, so I hope that she likes them, when they eventually get delivered! I received my parcel this month from Ruth. She is a busy student, so it was especially nice for her to take time out of her first week back at uni to get me some things. Ruth was thinking outside the box both in the fact that some of the items were not edible (though still very much food related), and because this month, I didn’t get a box, but the items came in a bubble wrap bag. Great idea, and it should save a bit in postage. Of course, I have popped all the bubbles saved the bag for another occasion. Ahem! Ruth sent me some really cool things. 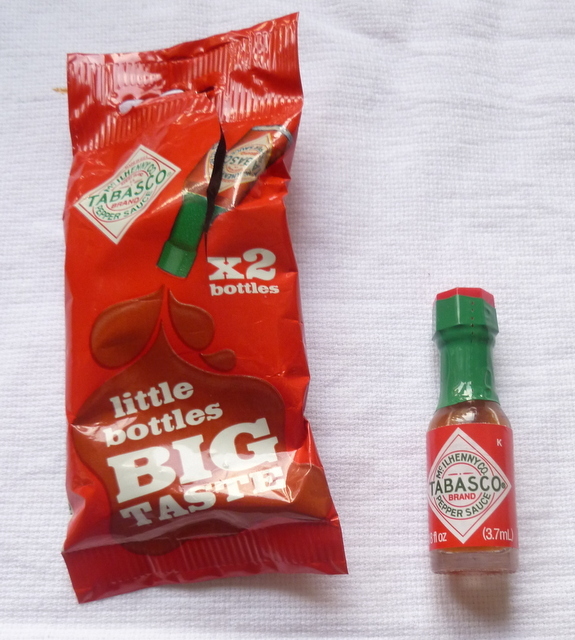 Not least of which were these cute little Tabasco bottles. They stand about 3 cm tall, but of course, they punch far above their weight in the flavour department. Tabasco with cheese on toast is A Thing, you know. This is a lovely little sweet treat. 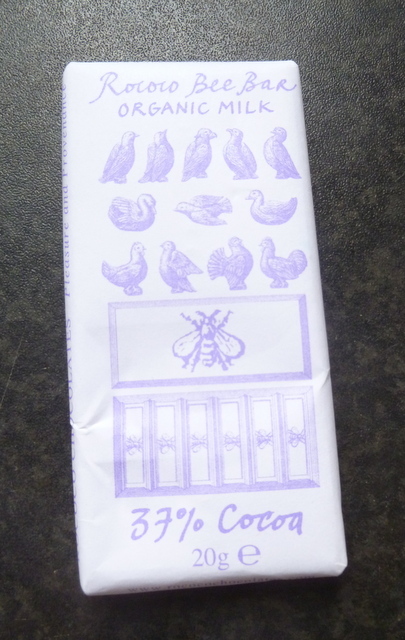 Apparently, they are called Bee Bars because Rococo uses a bee pattern on their chocolate moulds. I am an inveterate nibbler of chocolate, and can happily make a bar last a month. Much to the Big Guy’s consternation. He feels that chocolate should be consumed all at once. I have hidden this, so I can nibble in peace. I received some healthy snacks. I think that Ruth has been reading my latest efforts to eat better, but with lower calories. 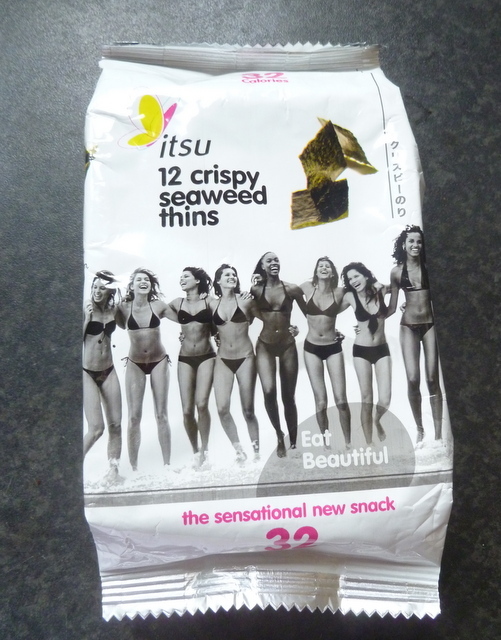 These Seaweed thins fit the bill perfectly, especially for those times when you know that only a salty snack will do. 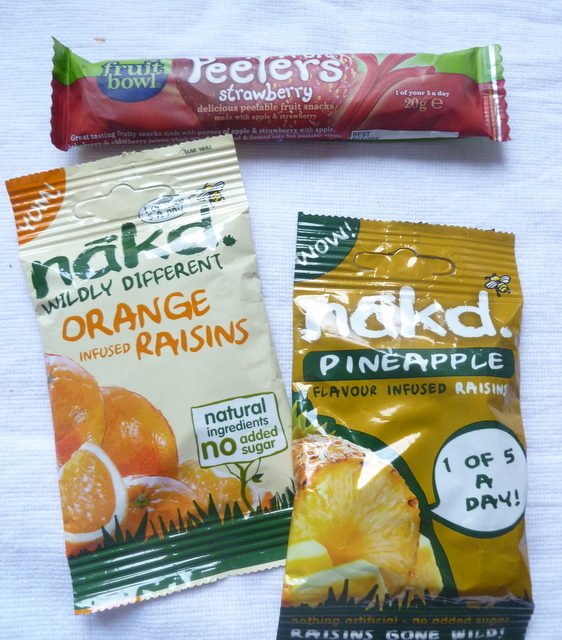 In keeping with the healthy theme, I also got some fruit leather and flavoured raisins. I suppose that these are the same as soaking rum in raisins, or similar. I am looking forward to adding the pineapple raisins to my next batch of muesli. I think the orange ones will go well in mince pies and has given me an idea for a slightly different mincemeat, so I may do a little bit of experimenting, so that I have some ready for my annual mince pie and mulled wine party. 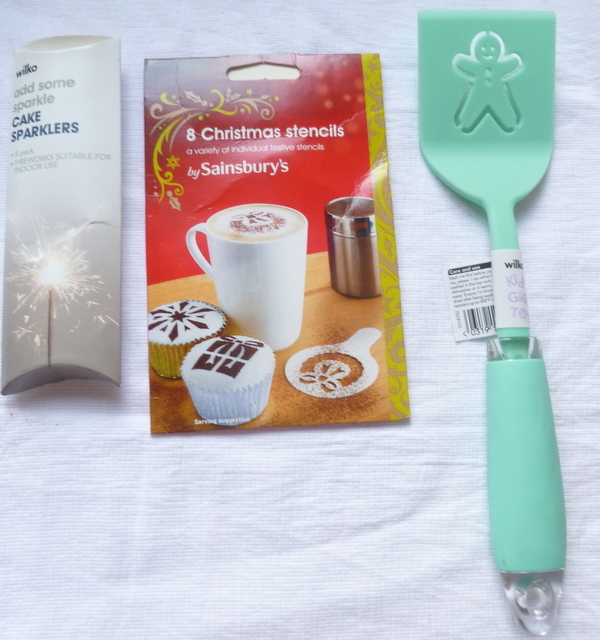 Last, but not least, I also got some cake sparklers, and a packet of Christmas stencils, both of which will also be a big hit at the mince pie party. And this lovely little gingerbread spatula. It is traditional at this time of year to make parkin, especially for Bonfire Night. We don’t get a Bonfire Night over here, but there is definitely something about autumn that makes you crave ginger and warmer spices. I have a parkin in a tin, developing that lovely sticky richness. Now I am inspired to make some ginger bread biscuits too. Thanks again Ruth, a really good parcel, and one from which I have also got a bit of inspiration. 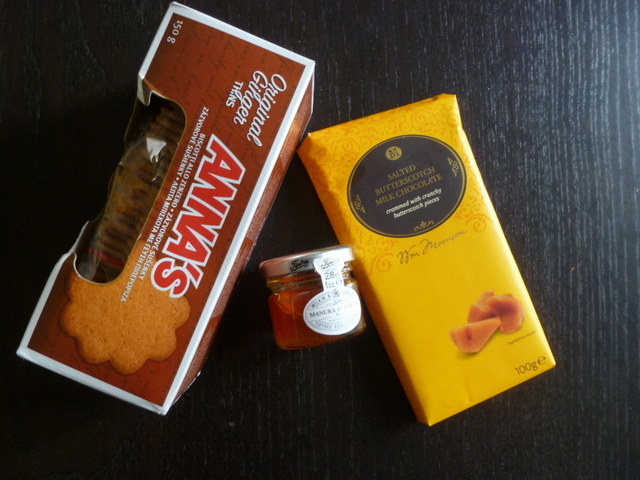 I thought that the title this month was appropriate for both the parcel that I sent, and the one that I received, as you can see from the photo above, which was jam-packed with goodies, and a recipe for a sweet treat! This month, I was matched with Emma, and was to receive a parcel from Abbie, neither of whom have a blog (…yet, I believe at least one of them will be joining us soon 🙂 ), but you can go and check out Emma’s gorgeous cakey Facebook page, and you can see what amazing things Abbie has found on Twitter. Abbie was very clever with her box, as well as stuffing it to the gills. And it arrived in 3 days between her tweeting to say she’d sent it, and me receiving it. This is an absolute record. For ages, I was thinking that the chocolate was a new brand called M. I am an idiot, and have just realised that it comes from that famous supermarket. Salted butterscotch chocolate, it is delicious, and you would be right in thinking that I have started this one already. There is a small pot of manuka honey, which I am dying to try. Abbie also thought of the Big Guy, giving him some Swedish ginger thins. This is the first time we have had something that he can reminisce over, and I think I may not see many of these. This wasn’t just a sweet box, though. I also got savoury goodies. I rubbed the Ras el Hanout on a lamb cutlet, and ate it as part of a meal filled with temptations. The rice crackers will make a great snack, but I have an idea that they will also make a really tasty crust for fish, so I think that will be an experiment that I will be making soon. I have heard of smoked salt, but never tried it. It is actually great, bringing a subtle smokiness to dishes. I am not usually a fan of salting things, but have been getting more into it, as I have had quite a few gifts of salt lately. It was Abbie who sent me the Tinkerbell peppers. She wrote a little card, to say that she had these every day in Ibiza. This was also the first of two recipes she sent me, along with the ingredients. This is genius, and I wish I’d thought of it myself! Abbie suggested that I grill the peppers, and serve them with a sprinkling of the salt. I took most of her advice, but this is what I did with them in the end. She also sent me the recipe and ingredients to make up her Guilty Pleasure. 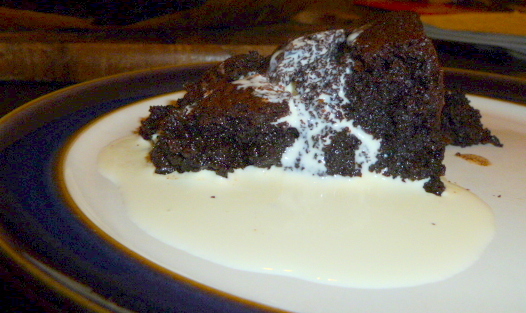 She has given me permission to reproduce the recipe on ediblethings, so I will let you know about this next week. Thank you so much for this parcel Abbie, not only has it been an inspiration for future boxes, and fantastic recipes, but I dread to think how much it must have cost you to post this little treasure trove. I am amazed! Thanks also to the lovely Carol Anne of This is Rock Salt, who hosts and organises us European penpals. This is no mean feat, I can tell you. It’s that time again when I can reveal my matches for Foodie Penpals. I have to say, I really am enjoying this, from deciding what to send out, and trying to make that as tailored as possible to my penpal; to receiving my own box and thinking about some great recipes to make with the contents. This month, I was matched with Kay at KayTeasCakes and I got a parcel from Teresa from Rockspring Crafts. Unfortunately, at the time of writing, I have just heard from Kay that her parcel has not arrived. I am away at the moment, and don’t have a tracking number, although I am trying to sort something out. I am really sorry that there has been this problem for Kay, but if I have to I will recreate her parcel and send it to her as soon as I get home. In the worst case scenario, Kay will get two parcels next month, but I hope that her parcel will arrive soon. Please go and cheer Kay up by marvelling at the beautiful cakes that she makes for her stall in Harringay, or even popping along and buying some if you are in the area. I was very lucky to be matched with Teresa this month. She was also kind enough to notice that I am an expat, and ask me if there was anything I needed from home. I am really appreciating these offers from my penpals, it is nice that people think that there will be things I am missing. Teresa sent me a lovely box of goodies, some of which have really got me thinking. She obviously had a good time finding me unique items. An added bonus is that she is a fellow Westcountry person, so, it has been great to get products from almost home! Firstly, was a lovely lamb, with garlic, fennel and chilli recipe. I love lamb, and we can get very good Texel lamb here, so I know this is going to be a winner. There was also some pineapple and papaya. I make my own muesli (mostly because too many shop-bought mueslis have unwelcome banana chips in), and this has already featured as a very tasty addition. I am thinking of doing some baked goods with the rest soon. Of course, I shall blog it when I do. Also included was some onion salt. I have never used flavoured salts before, but this is a great addition to salad dressings, and I am sure it will be in many more things to come. These spices will certainly come in handy. 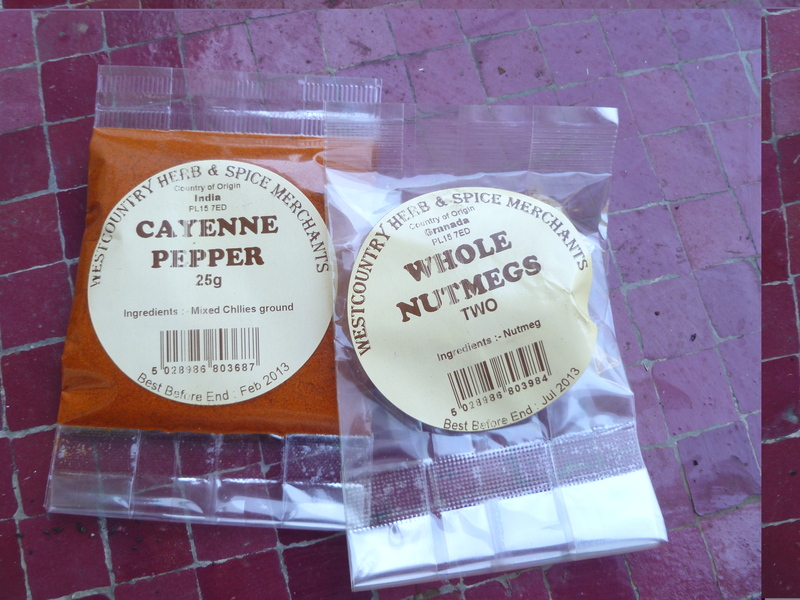 Spices form an essential part of my store cupboard, and I use both cayenne and nutmeg regularly. I have already grated a bit of nutmeg into some rogue nettles that popped up in my broad bean patch. I wasn’t about to let them go to waste, so I cooked them like spinach, and added butter and nutmeg after I had squeezed out all of the moisture. I love this way of eating nettles, and definitely recommend that you give it a go. They are also fantastic as a spinach substitute in curries and greek dishes, like spanakopita. 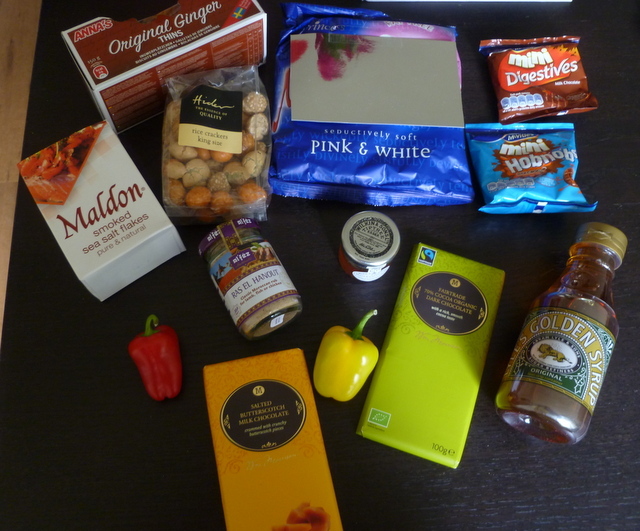 Teresa says that she enjoys finding a few new items to include in her foodie parcel. 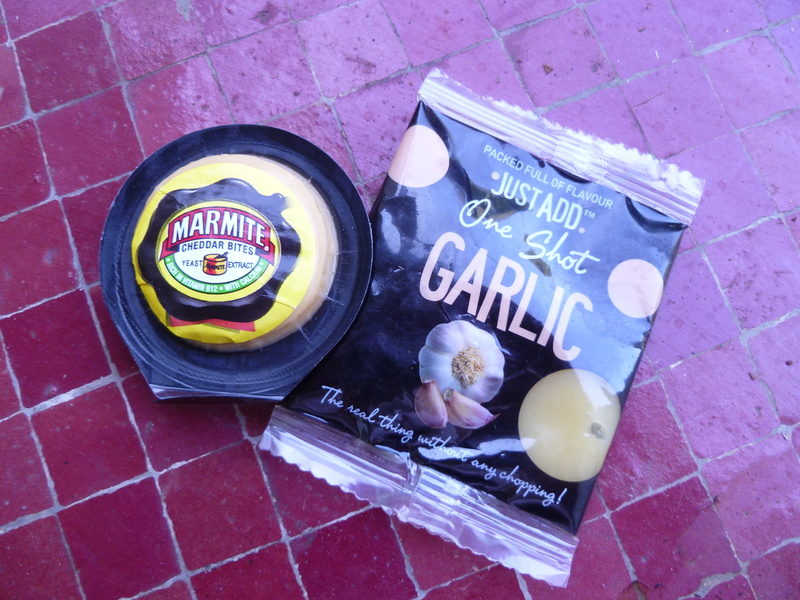 This time it was One Shot Garlic and Marmite Cheese. Originally there were three of these moreish little cheeses, but I think everybody gets one item that doesn’t make it as far as the photo, and this may have been mine this time. Ahem! Teresa took a chance and sent me a meringue. Unfortunately, this was the cracked in the box that I refer to in the title. 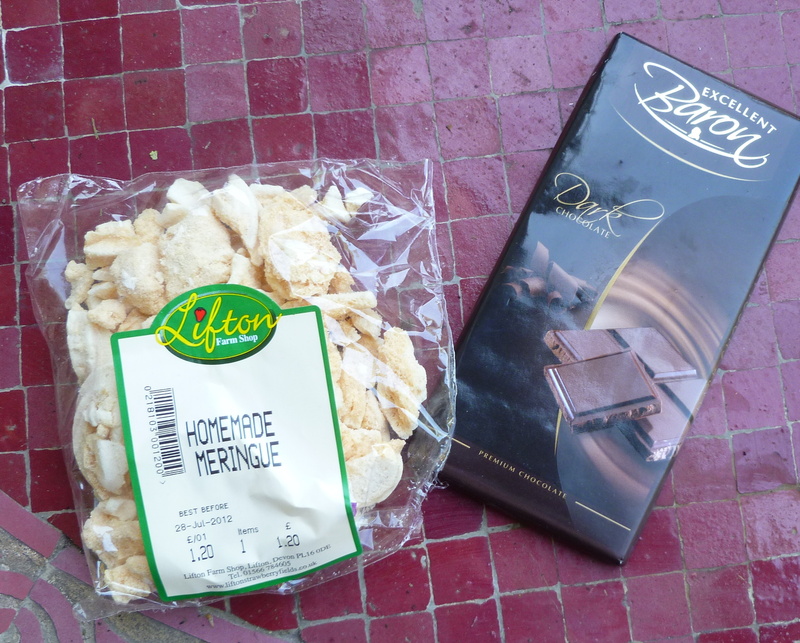 However, I am really pleased, because the two of these ingredients are the basis of a great dessert that I first had in Sweden. 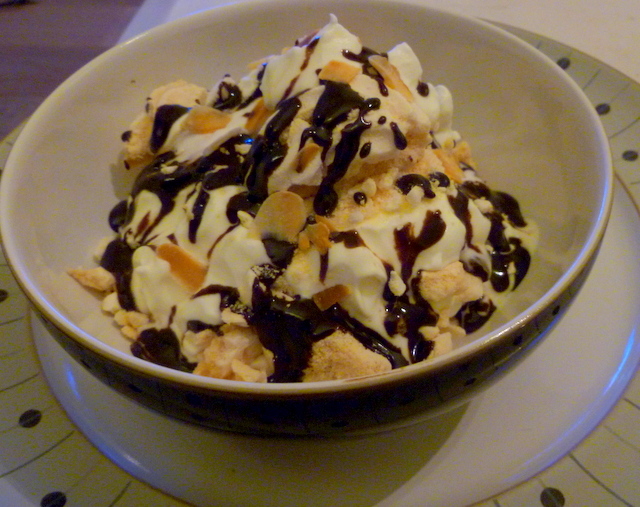 It is called Meringue Suisse, and I will make and blog that soon. It requires broken meringue, and I am lazy, so the Foodie Parcel has saved me a job. 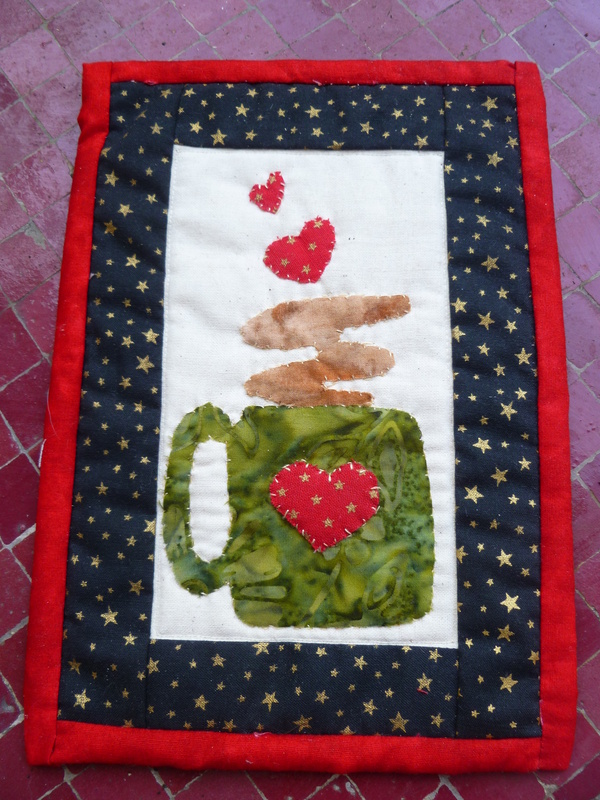 To help pack things together, Teresa included a mug-rug that she made herself. . I am always in awe of people that can make their own things. I did roughly six weeks of needlework at school, and the teacher made me unpick and re-sew everything that I ever made. I caught her out once, when I just returned to my seat, and didn’t unpick nor re-sew anything, returning for her approval a little later, and she passed it. I found that really discouraging though, and have never attempted to make things with textiles again. I really love my mug rug. Teresa makes them from scraps leftover from quilting and other projects that you can see on her blog, and of course, I love leftovers! 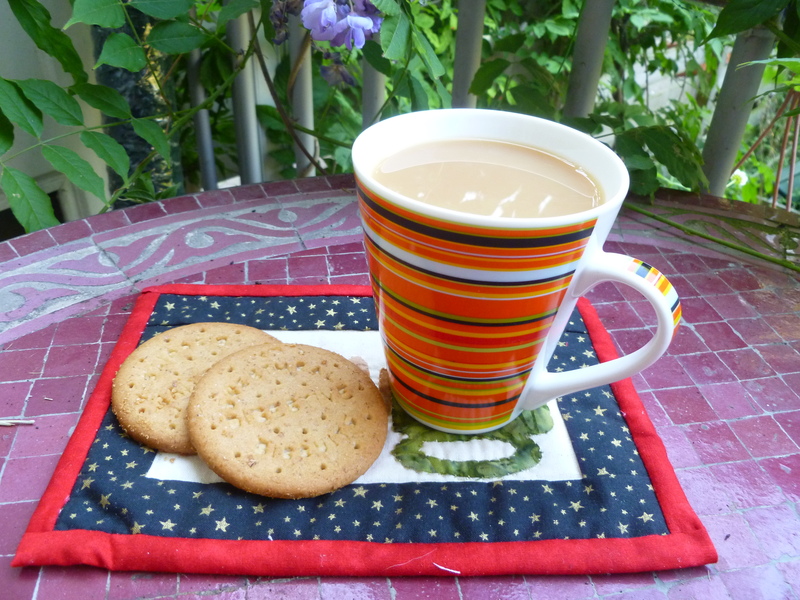 She says that the idea is to have something bigger than a coaster & smaller than a placemat to hold a cuppa with space a couple of biscuits or treats. And look, that is exactly right. 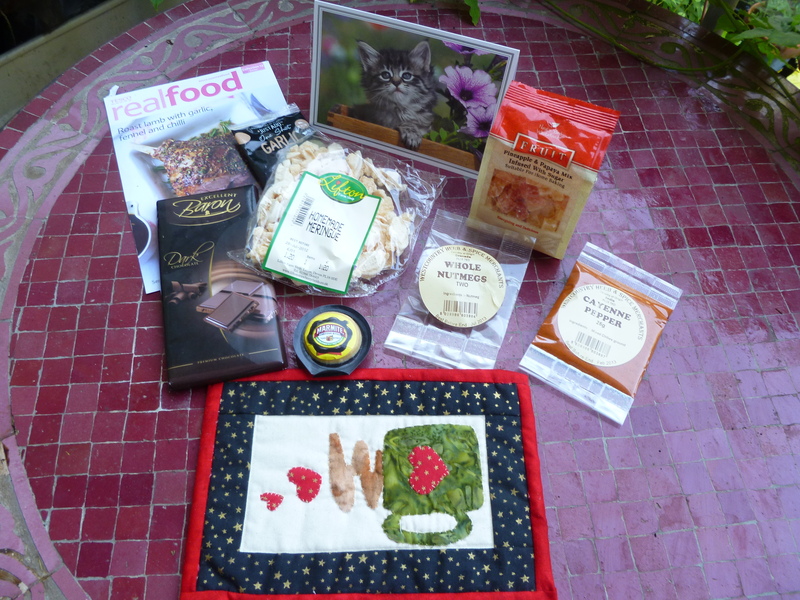 Thank you so much Teresa, for such lovely treats, and to Carol Anne for organising Foodie Penpals in Europe. The other day was the Big Guy’s birthday. 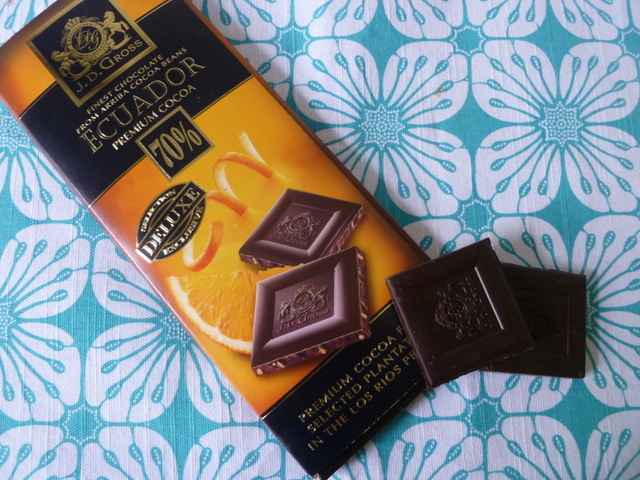 He loves chocolate, and I had some extraordinarily good chocolate with orange pieces that was given to me by my Foodie Penpal. 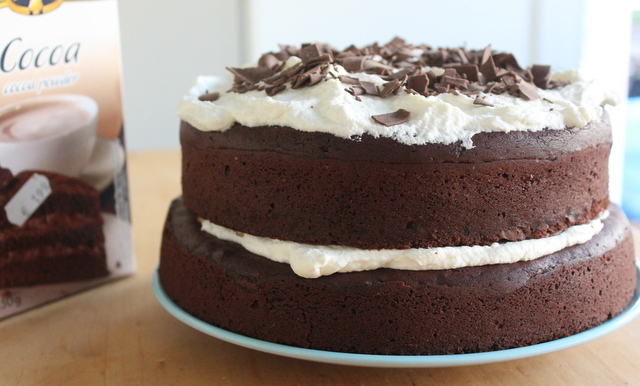 I had been saving that chocolate for a special occasion, and what better than to make a birthday cake? I decided that a Brownie would be right up the Big Guy’s street. And that I would use the extraordinarily good chocolate as the chocolate chips inside. I used JD Gross Finest Chocolate Ecuador. It has very good candied orange in it, the pieces are still chewy, and spike the chocolate throughout. 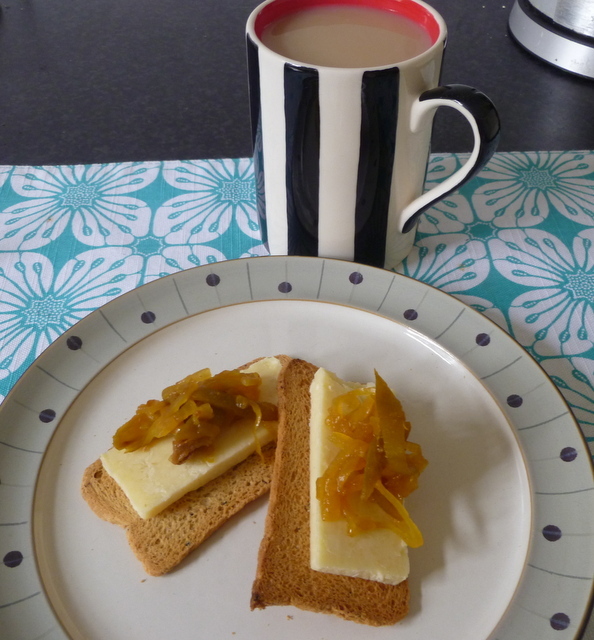 I boosted the orangey hit with a tablespoon of marmalade, but you can just use the marmalade if you can’t find the chocolate. Or you could use some chopped candied peel, if you prefer. 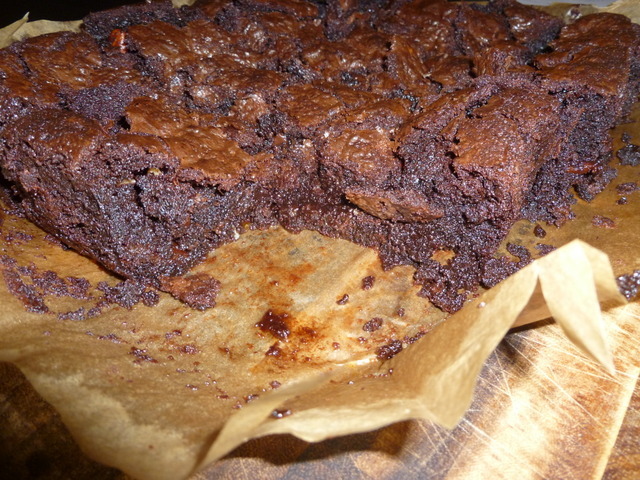 The first and last recipe for making brownies that I learned came originally from Nigel Slater. I just adjust the things I add, but always use this method and it has never let me down. If you make this you will understand why I go back to it time after time. Preheat the oven to 180°C, and line a tin with baking paper. I use my roasting tray for this, and it is the perfect size. A largish square cake tin will also be fine. Make a bain marie from a saucepan, with a little boiling water in the base (not more than 3 cm deep) and a bowl over the top. Don’t let the water touch the bowl. On a low heat, melt the chocolate in the bain marie. Don’t stir it too much, just let it sit, or you risk it going grainy. If there are floaty lumps of chocolate , just push them under the molten bits, and they’ll soon melt. While the chocolate melts, start beating the butter and sugar together. I have a hand-held electric whisk. The butter & sugar must be softer than a gentle whisper, so I’d recommend this as a minimum, unless you are Geoff Capes. Keep going until the butter and sugar is almost as pale as consumptive Victorian. Please don’t skimp, because you are incorporating air, and it will help produce the most amazing consistency when you eat it later. As soon as the chocolate has melted, add the marmalade. Once this has just melted, remove the bowl from the bain marie and leave it aside to cool a little. 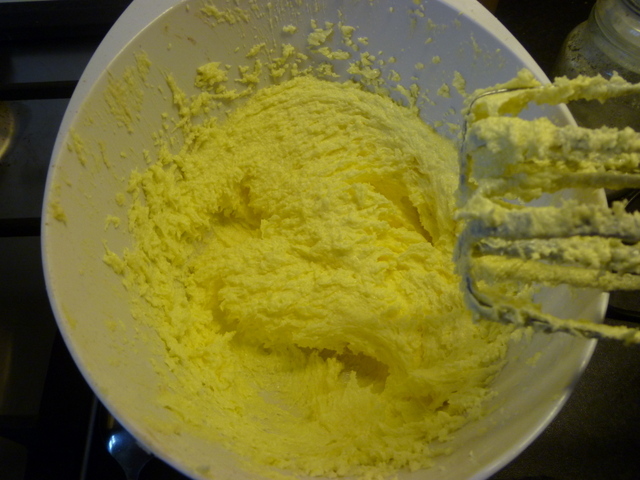 If your butter and sugar is not quite ready, go back and whisk it some more. You need it to be almost runny, but not actually runny, there won’t be a lot of air in that, but trust me, you’ll know because it gets very creamy. Sieve together the flour, cocoa, baking powder, and salt. This is also supposed to incorporate air, but I often don’t bother with just flour. I have never tested this, by baking one with and one without sifting, but I also don’t get flat cakes, either. However, when cocoa is involved, I always sift it, because cocoa can get a bit lumpy, and it will make your cake feel gritty, until you bit through a lump and get raw cocoa in your mouth. Incorporate the beaten egg into the butter and sugar, a little at a time. Make sure that it is well mixed before adding more. You can also increase the speed at which you beat each time you add some egg. Fold in the melted chocolate, chopped chocolate and nuts, using a metal spoon. You don’t want to knock all the air you took ages adding, so only mix until the moment there is no more pale butter streaks. Fold in the flour and cocoa, and again, only mix until you see no more flour. Be gentle, this is time spent with your cake batter, not a sprint race. Pour your batter into the prepared cake tin, and use a spatula to get the sticky bits from the bowl. Or if it is your Big Guy’s birthday, you can also let him take the rest of it with a spoon, or his finger. Smooth the top of the batter in the tin, and put it in the oven for 30 minutes. The cake will sink slightly in the middle, this is perfectly acceptable (I’m not Mary Berry), and is because of the rich, gooey consistency. Pierce the centre of the brownies with a skewer. In this recipe, unlike many cakes, you want the skewer to be a bit sticky. It should not have any raw cake mixture on it though. Again, you’ll have to trust me when I tell you that the difference is obvious. If it is not quite done, bung it back in the oven, but beware that the difference between raw cake mix and sticky is small, so it should take less than 5 minutes, check it after 3. If you are going to eat this warm, and it really is tempting, leave at least an hour after it comes out of the oven, or it will be too liquid. These brownies solidify a bit as they cool. Divide them into 12 brownies after the hour. The brownies are gooey and rich as a warm dessert, for sure. But they really are very, very good served cold, because they have that perfect combination of the crisp shell and rich, soft centre, studded with the nuts and chunks of that extraordinary chocolate. Eat them on their own, if you must, but they are better with cream or a good vanilla ice cream. These brownies also keep well in an airtight container, and remain moist and fudgey. Exactly two Fridays ago, I had to chase the postie down the road for this. My doorbell is broken. He didn’t knock the door, instead shoving one of those really irritating “we-called-when-you-were-out-now-you’ll-have-to-schlep-to-a-post-office-across-town” cards through the door. Luckily for me, I had been waiting in for this, so I was able to spring into action when I heard the letterbox. 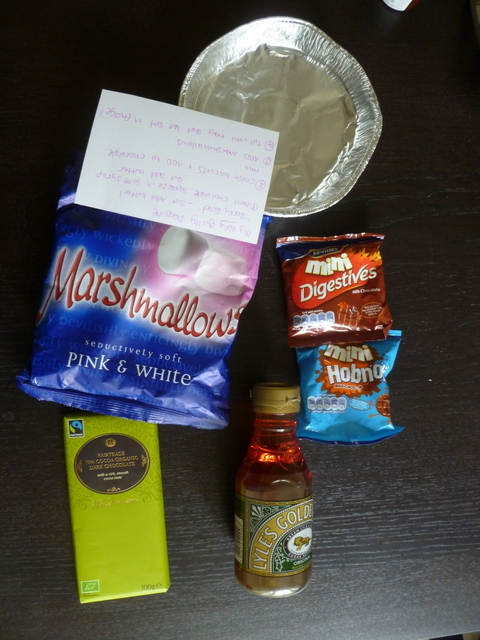 This my first Foodie Penpal Parcel. I had been seeing people all over Twitter talk about this, but thought that it was probably only for people in the same country. I was glad to discover that Carol Anne at Rock Salt had taken the idea from Lean Green Bean and was coordinating this blog swap for the whole of Europe. I am really glad it is so inclusive. There are also groups across a lot of the World, so you can probably find one and join in. You don’t even need to have your own blog; readers are welcome too, and many of the penpals will be happy to host a guest post on their site for readers to write about what they got. I was matched with LoopyLou, and got The Lone Gourmet as the person to send me a parcel. Such a coincidence that both my matches were called Louise, and one also used to live in the Netherlands. I’m not sure if these matches are planned or random, but I enjoyed the synchronicity of it all, anyway. I got a little carried away with the weight on my parcel, then realised it would have cost a King’s ransom to post from over here (this is a great tip for next time; jars are really heavy). I was heading back to the UK for Mum’s birthday, so I decided to post it over there. Through a series of coincidences and holidays, my parcel ended up being hand-delivered by my sister, and finally ended up in Lou’s greenhouse at the beginning of this week, in good time for the reveal day, but probably not in time for her to have used any of the ingredients. If you want to see what I got for Lou, head over to her blog. Louise at the Lone Gourmet was very kind and sent me things that she knows I can’t get over here. It was a real taste of home. A lot of thought went into this, and I’m really grateful to her for taking the time to source some typical English fayre. Firstly, I got some Earl Grey tea. Of course, you can buy what the Dutch call Earl Grey over here, but every British expat knows that you can’t get a good builder’s-strength cuppa in continental Europe, and so tea is always something on the list of things that you ask other people to bring over when they come. I also love the packaging for this product – it comes in a paper cup which you can use to hold your precious brew. I love this idea. Multiple-use packaging really appeals to the Womble in me. I also got a sachet of organic tikka masala mix, the most classic of the curry dishes for the British palate. It has a chicken recipe on the back, which I intend to try. But, I do think that this also has potential as a spice rub for white fish. I am going to halve the mixture, and do a little experimentation with this. 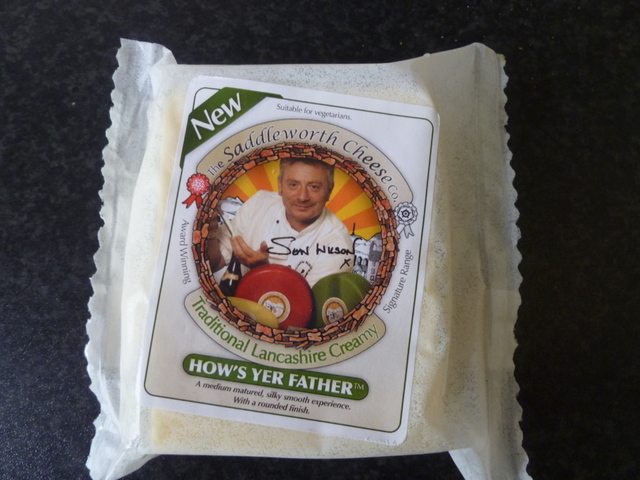 Louise got me some lovely Lancashire Cheese, which is quite local to her. The eagle-eyed amongst you may notice that it has a picture of a moustachioed Martin Platt from Coronation Street on the front. Apparently, like Blur’s Alex James, this is what he did when he left the Street, although I gather he is much less of a bore about it all. It’s a good cheese – a crumbly texture and slightly sharp. I had a snack of a little to test it when I opened the box (well, it would have been rude not to really), and then I used it in a tart with probably the last asparagus of the season. I will blog the recipe for this in the next couple of days. Finally, I got some extraordinarily good chocolate. I have managed to stick to only having eaten a single square so far, since I needed to open it to take a picture (honest, Gov), but I have had to hide it from the Big Guy. I think that this should be saved for a special chocolate mousse or something else that will do it justice. 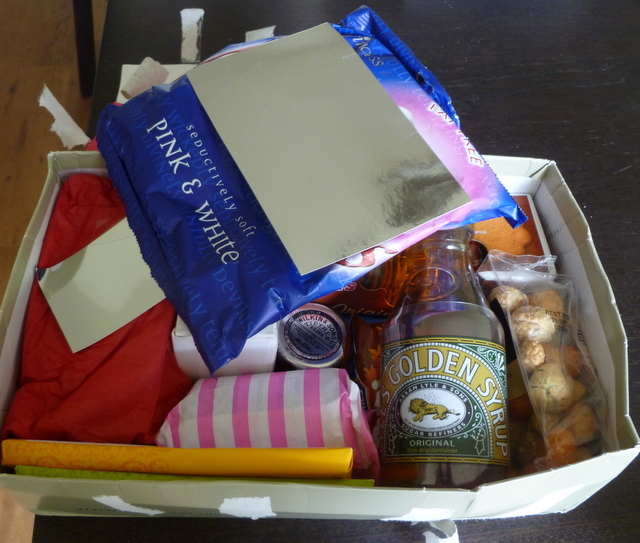 Thank you so much Louise, for this wonderful box, and to Carol Anne for organising this lovely treat. 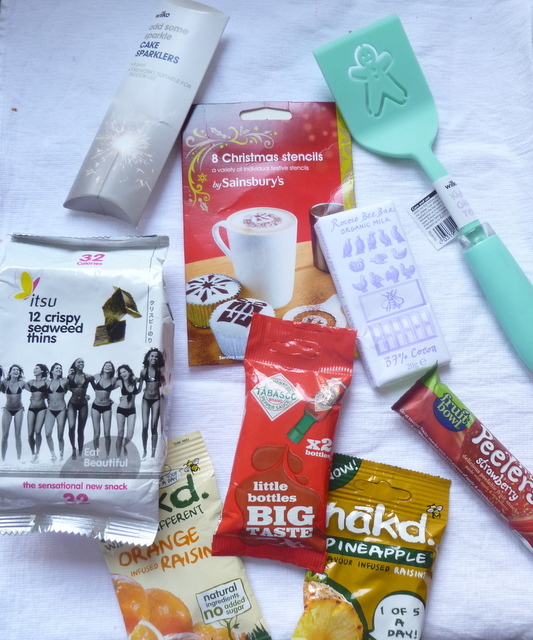 It has been so nice to browse through the two penpal blogs, find other new blogs, and get to know my penpals, not to mention the fun I’ve had thinking about the box I was going to send, and the ingredients that I received.